What size electrical wire should you use when hooking up an electrical receptacle (wall plug or electrical outlet)? Here we explain the choice of No. 14 or No. 12 copper wire for 15A and 20A electrical circuits where receptacles are being wired. What Size Electrical Wire Should I Use When Wiring an Electrical Outlet (Receptacle)? For a 15-Amp circuit use #14 copper wire (or #12 copper-clad aluminum wire). 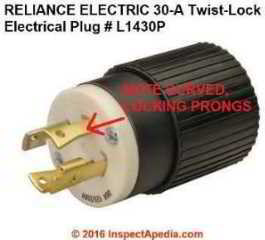 The fuse or circuit breaker feeding this circuit is rated for 15 amps. For a 20-Amp circuit use #12 copper wire (or #10 copper-clad aluminum wire).The fuse or circuit breaker feeding this circuit is rated for 20 amps. For a 30-Amp circuit use #10 copper wire and a fuse or circuit breaker rated for 30 Amps. Note1: it's safe and OK to use a smaller (lower ampacity) fuse or circuit breaker, such as a 15-amp fuse protecting a circuit wired with #12 copper wire. Note2: it's generally safe and OK to use a larger size electrical wire, and a larger wire size may in fact be required for longer wiring runs. Generally you want a 3% or less voltage drop across the wire from source to point of use. 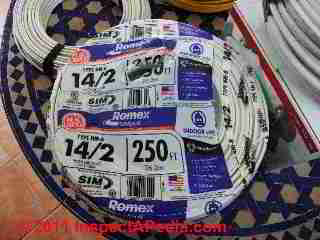 For the U.S., electrical wire sizes vs. circuit ampacity are given in National Electric Code Table 310-16. Watch out: in complex circuits that have many connections within a single junction box you could get into trouble: the number of connections that are allowed within an individual junction box depends on the wire size and the size of the box itself. So increasing just the wire size could require that you use a larger electrical box. Sketch courtesy of Carson Dunlop Associates. Electrical Conductors: Do I Need 2-Wires? 3-Wires? 2-Wires with Ground? The electrical wire must have the proper number of conductors. In modern electrical circuits used to wire receptacles (electrical outlets). 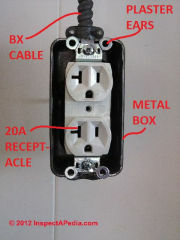 Typically an electrical receptacle is wired with two insulated wires and a bare ground wire, all three of which are encased in a plastic (NMC) or metal (BX) jacket. You'll see this wire labeled as 14/2 Type NM B with ground (photo at left) or 14/2 Type NM C with ground. These wires are color coded black, white, and bare (photo below right). 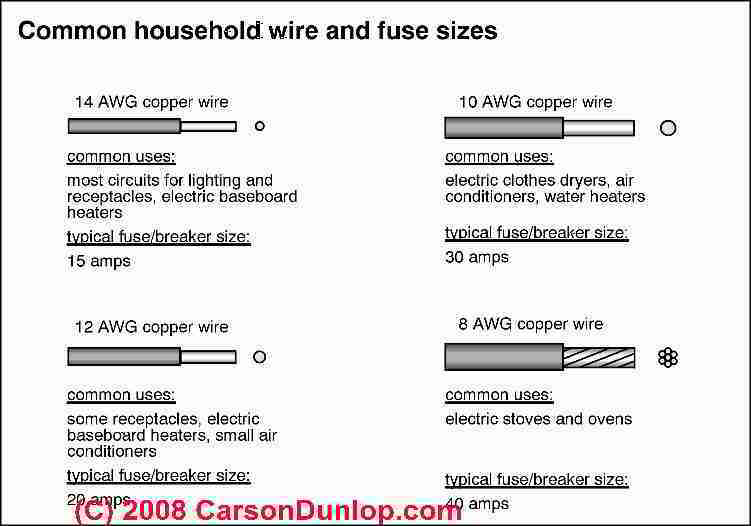 Sketch at left showing the number of conductors in types of electrical wire is provided by of Carson Dunlop Associates. and also SAFETY for ELECTRICAL INSPECTORS. Our photo at page top is not an example of a proper electrical outlet installation. Question: how many electrical receptacles are allowed on a 20-amp circuit? How many receptacles on a 15-amp circuit? How many receptacles can be wired To one 20 amp circuit No. 12. Wire - John K.
Notice that extra horizontal slot? You won't see that on a 15-Amp electrical receptacle. Question: Wire size required for a 30A Wall Plug for an RV Power Drop? What about voltage drop on the circuit? 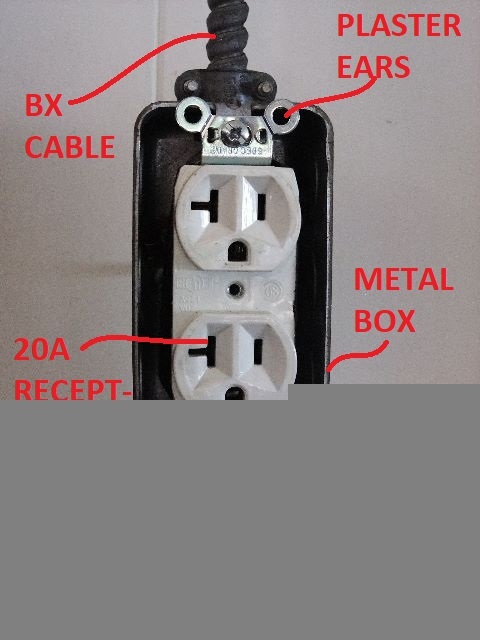 Watch out: you do NOT want to provide 30 Amps to a typical electrical receptacle ("outlet" or "wall plug") as devices connected to those wall receptacles expect to be protected against overcurrent at either 15A or 20A; you'll see that a 20A receptacle looks a bit different, having an extra slot. 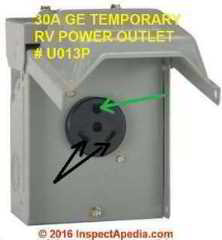 Above I illustrate a typical RV temporary outlet box for taking power to an RV. This is a GE unit sold at various electrical suppliers and building supply stores. 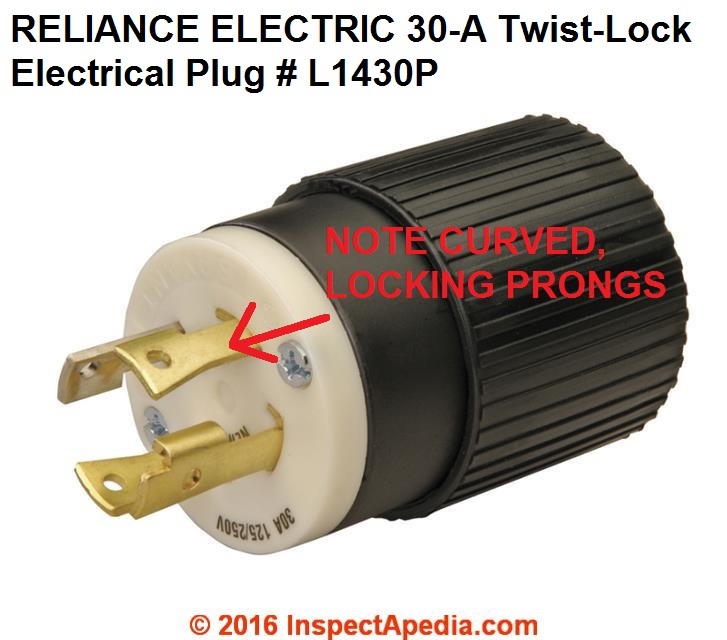 Another sort of 30A electrical receptacle and the wall plug that plugs into it uses a different design: you'll see that the openings in the recptacle are curved and the plug's "prongs" are also curved or in other designs the receptacle and mating plug use an angled opening and prong. Watch out: DO NOT just run 30A to a typical wall receptacle. Typically a #10 wire can handle 30A 120V loads and lengths such as what you describe. Tell me where you got the requirement for #8. You're right that it's safer and sometimes required to go to a heavier wire gauge (#8) for longer runs. If your installation permist a 3% voltage drop, then a typical wire calculator or voltage drop calculator (there is a plethora of them online) will say you could have used a 42 foot length of #10, so #8 sounds safe to me. I used both www.elec-toolbox.com/calculators/voltdrop.htm and Southwire; Southwire also has a nice voltage calculator and as a wire manufacturer they of course have both an interest in proper wire use and engineers on staff. Watch out: when going to a larger wire size, depending on the number of wires and connections in the electrical boxes on the circuit you may need to go to a larger electrical box size to meet the wiring space requirements. Watch out also: ordinary electrical wire is not intended for use as an "extension cord" and is not intended for use being repeatedly plugged in and out nor left exposed and unsupported. . Here's what Southwire's voltage drop calculator told us when we assumed the wire was 120V, 30A, 42 feet long, "underground / direct" though in conduit or overhead didn't change the result by much: all instances gave less than the typically-allowed maximum of 3% voltage drop. 1 conductors per phase utilizing a #10 Copper conductor will limit the voltage drop to 2.21% or less when supplying 30.0 amps for 42 feet on a 120 volt system.
. The calculations used to determine the recommended conductor sizes for branch circuits are based on 60°C ampacity ratings for circuits rated 100 amps or less or marked for use with #14 AWG - #1 AWG. Circuits rated over 100 amps or marked for conductors larger than #1 AWG are determined using 75°C ampacity ratings. Calculations to determine service and feeder conductor sizes are based on overcurrent device ratings rather than actual expected loads which are conservative and may yield oversized conductors. No calculations take into account temperature correction factors or conductor de-rating. This voltage drop calculator is applicable only to NEC applications. It does not optimize conductor sizes for several different loads at various points in a circuit. The total combined load and length of the circuit must be used. Watch out: finally, I note that you plan on running 8/2 wire? Surely you mean 8/2 with ground, right? Check with your electrical department about required permits and safety inspections. Continue reading at SE CABLE SIZES vs AMPS - complete table of wire sizes, gauges, uses for buildings, or select a topic from closely-related articles below, or see our complete INDEX to RELATED ARTICLES below. Or see WIRE SIZE FAQs - questions & answers posted originally at this page. 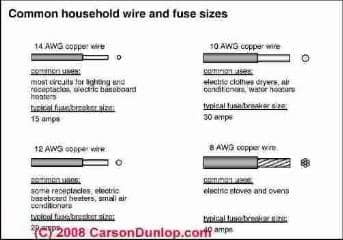 SIZE of WIRE REQUIRED for ELECTRICAL RECEPTACLES at InspectApedia.com - online encyclopedia of building & environmental inspection, testing, diagnosis, repair, & problem prevention advice. Questions & answers or comments about how to install and wire electrical outlets or receptacles in buildings.